Platinum 2.5mm Wide Flat Wedding Ring - Platinum, plain 2.5 mm wide flat wedding band. The ring is a polished finish. Different finishes may be selected or specified. 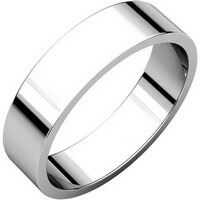 Palladium 2.5mm Wide Flat Wedding Band - Palladium, plain 2.5 mm wide flat wedding band. The ring is a polished finish. Different finishes may be selected or specified. Platinum Wide Flat Wedding Band - Platinum, plain, 3.0mm wide, flat wedding band. The wedding band is a polished finish. Different finishes may be selected or specified. 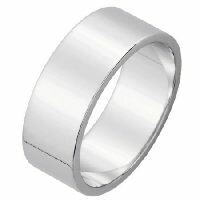 Palladium Wide Flat Wedding Band - Palladium, plain, 3.0mm wide, flat wedding band. The wedding band is a polished finish. Different finishes may be selected or specified. Platinum 2mm Wide Flat Wedding Ring - Platinum, plain 2.0 mm wide flat wedding band. The ring is a polished finish. Different finishes may be selected or specified. 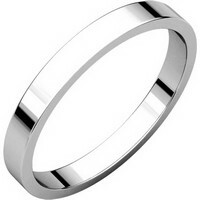 Palladium 2mm Wide Flat Wedding Ring - Palladium, plain 2.0 mm wide flat wedding band. The ring is a polished finish. Different finishes may be selected or specified. Platinum Plain Wedding Band Flat - Platinum, plain, 4.0mm wide, flat wedding band. The wedding band is a polished finish. Different finishes may be selected or specified. 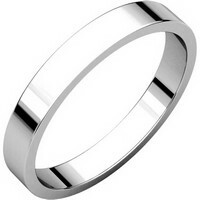 Palladium Plain Wedding Band 4mm Flat - Palladium, plain, 4.0mm wide, flat wedding band. The wedding band is a polished finish. Different finishes may be selected or specified. Platinum 5mm Wide Flat Plain Wedding Band - Platinum, plain, 5.0mm wide, flat wedding band. The wedding band is a polished finish. Different finishes may be selected or specified. 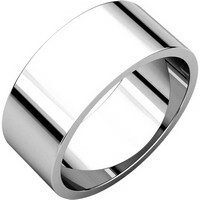 Palladium 5mm Wide Flat Plain Wedding Band - Palladium, plain, 5.0mm wide, flat wedding band. The wedding band is a polished finish. Different finishes may be selected or specified. Platinum 6mm Wide Flat Plain Wedding Band - Platinum, plain, 6.0mm wide, flat wedding band. The wedding band is a polished finish. Different finishes may be selected or specified. Palladium 6mm Wide Flat Plain Wedding Band - Palladium, plain, 6.0mm wide, flat wedding band. The wedding band is a polished finish. Different finishes may be selected or specified. 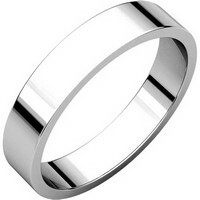 Plain Wedding Band Platinum 8mm Wide Flat - Platinum, 8.0mm wide, flat wedding band. The wedding band is a polished finish. Different finishes may be selected or specified. 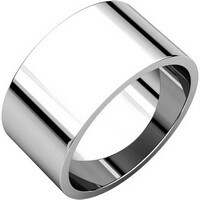 Palladium Plain Wedding Band 8mm Wide Flat - Palladium, plain, 8.0mm wide, flat wedding band. The wedding band is a polished finish. Different finishes may be selected or specified. Platinum Flat 7.0mm Wedding Band - Platinum plain 7.0mm wide, flat wedding band. The wedding band is a polished finish. Different finishes may be selected or specified. Platinum 7mm Wide Flat Plain Wedding Band - Platinum, plain, 7.0 mm wide, flat, wedding band. The ring is completely polished. Different finishes may be selected or specified. 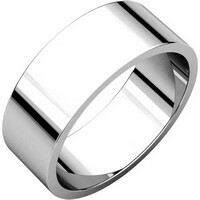 Palladium 7mm Wide Flat Plain Wedding Band - Palladium, plain, 7.0 mm wide, flat, wedding band. The ring is completely polished. Different finishes may be selected or specified.